Trumbull's Timmond Williams shoots over Wilton's Nick Kronenberg during a boys basketball on Friday, Feb. 8, 2019 in Trumbull, Conn. Williams scored 35 points for the Eagles. TRUMBULL — Wilton boys basketball coach Joel Geriak isn’t afraid to loosen his tie, roll his sleeves up, and get to work. Neither are his Warriors, who jumped out to a big lead over Trumbull and then closed out the FCIAC showdown with a 69-60 victory on Friday night. Wilton drew into a first-place tie in the FCIAC with Trumbull and Danbury at 10-2. The Warriors are 12-3 overall and the Eagles 13-3. Tucker Walden buried a pair of three-pointers, Andrew Smith and Zayvion Eusebe had one each, but it was Ryan Bineron’s eight-points inside the pain that sparked Wilton to a 24-15 lead after one quarter. 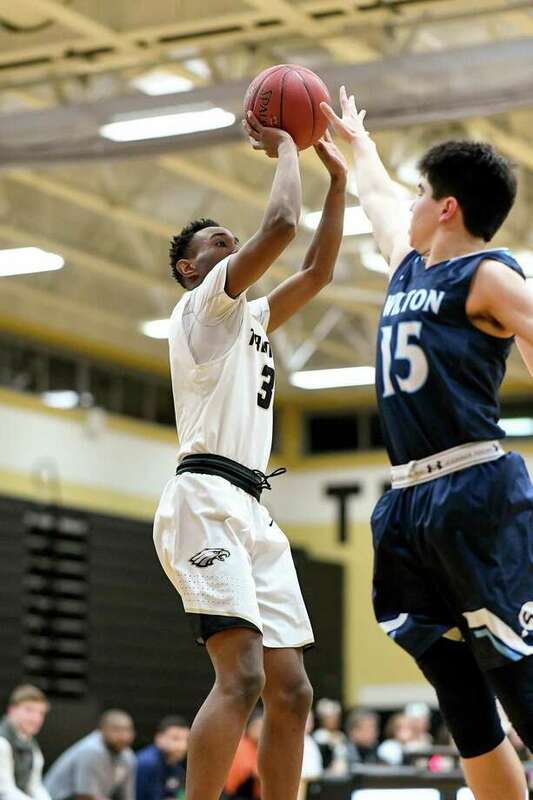 Trumbull’s Timmond Williams (35 points) led a couple of mini-runs in the first half, but each time the Eagles narrowed the gap, Wilton would respond. Smith knocked two more treys, and Ryan Schriber made one from beyond the arc, when the Warriors took the score to 41-26 at the half. Nick Kronenberg had six of his 11 points in the frame. Trumbull rallied back in the third quarter. The Eagles scored six points in transition with baskets from Mileeq Green, Quentar Taylor and Williams. Williams’ put back bucket — after Wilton went dry on seven trips (0-for-5 from the floor; two turnovers) — Geriak called for time up 44-37 with 4:34 left in the period. Kyle Hyzy drew an extra defender to him on a dribble drive coming out of the break, and found Walden open in the short corner for a three-pointer. Williams answered in kind for Trumbull, Green dished the ball off to Evan Gutowski for a foul-line jumper, and Williams dazzled the bipartisan crowd with an up-and-under finish of a baseline drive. It was now a one-possession game with two minutes left in the third. Jack Therriault followed a basket by Taylor with a putback off a rebound. Trumbull, once down 15, had the lead at 48-47. Eusebe scored off a spin move in the lane to give Wilton a 49-48 advantage. Williams’ three-point play with 5:03 on the clock tied the game at 53-all. Hyzy’s kick-out pass to Schriber led to a 3-pointer and Wilton went on to stretch its lead.